Looking for a few ways to freshen up your home without breaking the bank or sacrificing too much time? We’ve rounded up three fairly simple home improvement/decorating projects that can be completed in a day, even by beginners. Put aside one day this weekend and make a change that will refresh your home, without having to make a major overhaul! A fairly simple way to elevate any room is by faux-fancying up the baseboards using molding and paint. You’ll be pleasantly surprised at how much more upscale the room will look! Paint your new trim to match the existing baseboard. Put your scrap piece of wood on top of the existing baseboard. Your new trim gets nail gunned to the wall right above it. This way the scrap acts as a spacer so your trim is straight and even. Spackle over the nail holes and between the pieces of trim, if necessary. Once the trim is mounted to the wall above the baseboard around the room, prime the wall in between the two. Next paint the bit of wall to match the baseboard and trim and … voila! Wide, beautiful, elegant baseboards! Your backsplash can be a major focal point of your kitchen, and making a change to it — covering ugly tile, adding color, or adding a pattern — can make your whole kitchen feel refreshed. And if you use stick-on vinyl, you can change the look as often as you like! If you’ve already got tiles up, consider cutting your vinyl into triangles or squares to make a pattern on the wall. Or, you can purchase sheets of vinyl that already have the color and pattern you like and simply cover the entire existing backsplash with them! You can even find stenciled vinyl patterns that you can stick on a painted wall for a whole new look. 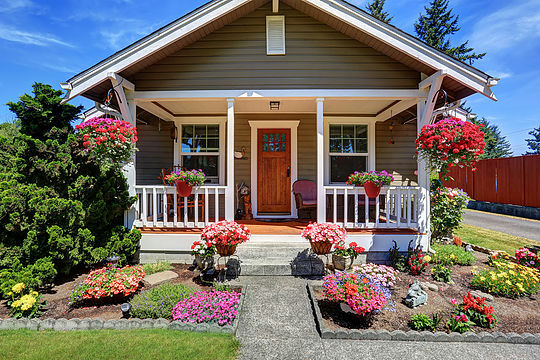 Curb appeal: Not only is it crucial if you’ve got your home on the market, but it’s also the first thing you see when you pull up to your house. Make coming home a pleasurable experience with a frontal facelift. Hit the three key points of the front of your home: the front door, the front windows, and the garden (or porch if you don’t have a lawn). Start by planting some low-maintenance flowering plants and shrubs against your home and along your walkway. No grass? Use planters on the porch and hanging baskets to showcase some lovely greenery and blossoms. Paint the front door. Choose a fun, bright color that complements your house color. Clean up those front windows, inside and out. Using newspaper ensures you’ll have no unsightly streaks on the glass. However, you will get unsightly ink all over your hands, so consider wearing gardening or rubber gloves to protect your skin. Not ready — or don’t have the time — to take on home improvement projects on your own? Sometimes it’s better to seek the help of a professional, in which case you’ll need to hire a licensed contractor or a handyman. But what’s the difference, and how do you know when to choose which one? A contractor is a licensed professional who has studied for, applied to take, and passed an examination mandated by the state licensing board. They also have purchased insurance and are usually bonded, which is a type of insurance that will pay the homeowner in case the contractor defaults or causes damages. When you need a contractor, you should always choose one who is fully licensed and bonded to protect yourself and your investment. Contracting jobs generally require specialized knowledge and machinery and may need several workers — sometimes with different types of licensing — and take more than a day or two to complete. A handyman is often a jack-of-all-trades and could have a state handyman’s license or no license at all. States usually impose a limit on the size of jobs they can take, defined by cost. For example, in California, a handyman cannot accept a job that costs over $500, including materials and labor. A handyman generally performs a variety of small jobs, such as painting, small plumbing and electrical work, and repairs. A handyman is best chosen via word-of-mouth referrals or using websites with recommendations and reviews, like Angie’s List or Next Door. Making changes and updates to your home can be so exciting! Contact us to discuss financing options available to help you turn your house into the home of your dreams. Flipping Out: Is Home Flipping a Profitable Investment?